What is the MyFlorida Alliance? The MyFlorida Alliance is an IT outsourcing project between Florida and Accenture Ltd. of Hamilton, Bermuda, and BearingPoint Inc. of McLean, Va. The project is designed to reduce the cost of government by consolidating technology resources and eliminating redundancies across state government. The two contracts are worth $140 million over seven years. Accenture will manage the state's enterprise technology services help desk, enterprise applications and e-communications. BearingPoint will provide data center services, e-communications between government and citizens and desktop management services. 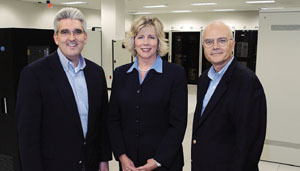 Kim Bahrani, former CIO of Florida, with Barry Webster, a partner in Accenture's government practice (left), and John DiRenzo, a vice president in the state and local practice of BearingPoint. Accenture and BearingPoint have contracted with the State Technology Office to form the MyFlorida Alliance. Florida's statewide IT infrastructure outsourcing project is still on track despite the loss of its chief architect, according to state officials. The sudden resignation Feb. 4 of state Chief Information Officer Kim Bahrami stunned industry observers and raised concerns that the state would abolish the independent State Technology Office or make changes in the MyFlorida Alliance outsourcing project. Six months ago, Bahrami's office awarded contracts worth about $140 million over seven years to Accenture Ltd. of Hamilton, Bermuda, and BearingPoint Inc. of McLean, Va., for the ambitious initiative, which involves the consolidation and sharing of technology resources to eliminate redundancies across state government. State officials familiar with Bahrami's resignation said there does not appear to be plans at this time to dismantle the state technology office or abandon the MyFlorida contracts. "This administration doesn't take down projects, it lets them work through the growing pains," said an executive branch source. Even the project's critics agreed. If the state were to unravel the MyFlorida Alliance project, "that would be a shock," said Doug Martin, spokesman for the American Federation of State, County and Municipal Employees. The governor's office declined to comment on the alliance project. Spokesman Jacob DiPietre said Gov. Jeb Bush intends to appoint a new CIO within 30 days. Bahrami is the second state CIO to leave Bush's administration. Roy Cales resigned in August 2001 after he was charged with forgery from an incident that occurred five years earlier and was unrelated to his state employment. Bahrami leaves on a better note. "Kim [Bahrami] resigned as state CIO to pursue opportunities in the private sector," said Carla Gaskin, a Florida State Technology Office spokeswoman. "It was in no way a reflection of her performance." Accenture and BearingPoint declined to comment on Bahrami's resignation and the impact on their contracts. The auditor general's office also has no immediate plans to review the MyFlorida Alliance contracts, said Jana Walling, deputy auditor general of IT audits and professional practice. In September, Florida Auditor General Bill Monroe released a study that openly criticized the state technology office for failing to follow sound business practices in certain technology procurements and for security shortcomings related to the state's enterprise network. The findings focused on a two-year period from 2001 to 2003. With many states still feeling the pinch from three years of budget shortfalls, turning over IT infrastructure support to the private sector is an attractive option. But it does carry a number of challenges, such as the political baggage associated with eliminating jobs in a down economy. The MyFlorida project has given IT infrastructure outsourcing "a national presence and exposure it didn't have before," said John Goggin, vice president and director of government strategies for the market research firm Meta Group Inc., Stamford, Conn. "It's leading in the direction a lot of states are going to have to go." Large-scale IT outsourcing deals have not fared well in the state government market. In 1999, Electronic Data Systems Corp. of Plano, Texas, backed out of a deal with Connecticut for IT services and support because it was unsatisfied with the state's terms. Georgia canceled a $1.8 billion communications outsourcing project in 2002 in favor of smaller contracts. Virginia also has embarked on an IT consolidation path that may involve some outsourcing. The state is seeking proposals for public-private partnerships that would support its IT infrastructure. Bush's 2004-05 budget proposal contains $20 million for the alliance, Bahrami told Washington Technology in January. While the Accenture and BearingPoint contracts were signed last August, the individual statements of work, which set forth the services the contractors must deliver, were being finalized at press time, Gaskin said. The State Technology Office has not awarded related contracts for the state portal for citizen services and for electronic filing of court documents. These tasks are slated to go to Accenture and BearingPoint, respectively, according to the Florida State Technology Office. The state has focused first on the applications and infrastructure agreements, because those aspects will generate savings faster than the portal, Goggin said. "The infrastructure is more important than the portal. The return on the portal will take longer than the infrastructure," he said. Goggin said the MyFlorida Alliance is a valid model for IT outsourcing. How well it works over the duration of the contracts will depend on which agency or department has responsibility for IT strategy, policy and spending and how well the contractors work together, he said. "If they have a strong governance model over the alliance contract, it will work well. If not, it will deteriorate rapidly with each vendor trying to get the best deal for itself," he said. The alliance contract offers both prime contractors substantial business opportunities, Goggin said. "There's plenty of business for each of them over the next few years without one trying to encroach on the other's business," he said. Before picking the contractors, the Florida State Technology Office studied their capabilities and the services they provided the state in the past to determine the services they would provide under the MyFlorida Alliance, said Barry Webster, Accenture's lead partner for the Florida government practice. "They divvied up the work based on our core competencies," he said. By guaranteeing the prime contractors a lot of business across state government, the Florida State Technology Office could negotiate prices below what it previously paid for the same services, Webster said.